Where can I buy wholesale flowers for DIY weddings and events near Albuquerque? If you want to get the best prices on the largest selection of flowers near you, shop a local florist. Because of our relationship with Albuquerque Florist, Albuquerque Floral can bring you seasonal favorites at affordable prices. Furthermore, when you book a FREE wedding consultation with Albuquerque Floral, you also get free tips and advice. Is it any wonder Brides and Grooms across New Mexico choose Albuquerque Floral? In addition to our everyday low prices on wedding flowers and vases, you can also buy arrangements for corporate events. Because Albuquerque Floral offers delivery services across the Albuquerque metro, you can always buy affordable flowers. If you are planning a wedding on a budget and need to save money, book a FREE wedding consultation with Albuquerque Floral. You can ask about our Top 5 Best Ways To Save Money with DIY flowers. You can finally rest a little easier knowing your wedding flowers are in good hands. Because Albuquerque floral works to bring you the best flowers and the lowest prices, you will always find something that makes you smile. Let us be your wedding flower guide. Conclude your search for the perfect wedding florist and shop locally, near Albuquerque. You will be happy that you kept your business local and we promise you will love the prices. Do you need help saving money on your wedding flowers? 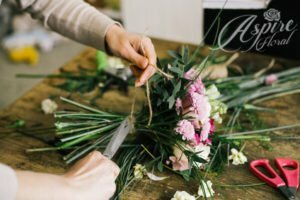 You can still get beautiful flowers on an affordable budget with our DIY classes. In addition to saving money on your wedding, you can also get free tips and advice with a wedding consultation at no charge. Furthermore, when you buy wedding flowers from the Albuquerque wholesale flower market the extra money you save can go towards a nice honeymoon or vacation. Both local and destination brides agree, Albuquerque Floral makes it easy to buy wedding flowers. Because DIY weddings are the most current trend in Albuquerque, we are working to provide you the best options. You can take advantage of special money saving offers when asking about seasonal flowers and DIY classes near you. In addition to your favorite flowers at wholesale prices, we also have a trained staff who is here to guide you in the right direction. You can save time by hiring one of our professional wedding planners, or do it yourself for additional savings. Either way, the team at Albuquerque Floral and Albuquerque Florist is here to support you on your wedding day. From bouquets to vase rentals and setup, we have your floral needs taken care of. Remember to ask about shipping options for wedding flowers to Albuquerque venues. When should I start planning my Fall wedding? If you want the best wedding venues, lowest prices and largest flower selection, book early. You can get started with a FREE wedding consultation by clicking here. You can take the stress out of planning your fall wedding and hire a professional wedding planner from Albuquerque floral. In addition to getting our expert advice, you also can save money with our award winning design services. Because we know you have a lot of options when choosing a wedding florist, please consider our Five Star reviews. In addition to having the highest rated wedding flower shop in ABQ we also are a part of the Albuquerque Florist Family. Most importantly Albuquerque Floral guarantees all of our work. That means you can rest at ease knowing we have the details ironed out. However, some of our customers prefer the DIY wedding option. If you would like more information on DIY wedding flowers click here. You can ask about money saving options and wholesale flowers when you book a FREE wedding consultation. Finally, a friendly and affordable wedding planner for my fall wedding! You can get the most out of your special day by planning your wedding early. Click here for details from Albuquerque Floral, Albuquerque New Mexico’s number one florist.